Classic Pave-Set Round Diamond Cathedral Platinum Wedding Set | Shane Co.
Seventy-nine round diamonds, at approximately .61 carat total weight, are brilliantly pav´-set around three-quarters of this classic wedding set crafted of superior quality platinum. 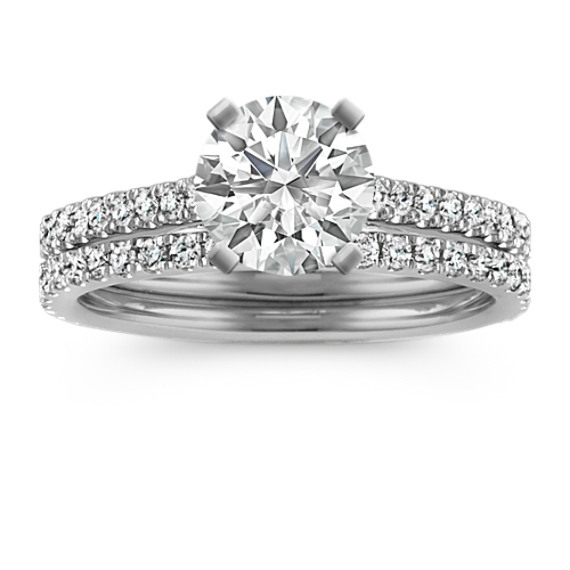 The scintillating cathedral style setting is perfect backdrop for your chosen center diamond. Each ring measures 1.75 mm wide and measure 3.5mm when worn together as a wedding set. I love this ring. We've been engaged almost a year now and I've gotten so many compliments on it. We had one minor issue, which Shane Co addressed right away.. We sized it down to a size 5 and less than a month after wearing it, one of the diamonds on the sides fell out and was lost. We were told it was due to sizing it down so small that the prongs weren't quite tight enough. Other than that it's been a great ring and we are happy with Shane Co.